In Praise of Paul Hindemith, 1895-1963, on the 50th-anniversary of his death, 28 December 2013 – Where is ‘art’ in all this? And more pertinently to our heading, where is the art of Paul Hindemith? From time to time the subject of fashion in music arises: how it is that the music of one composer, or even what might be termed a ‘school’ of composers, which is widely played and appreciated, tends to leave the concert, recording, or broadcast schedules and enters a period of neglect, perhaps rarely – or never – to return? Lord Kenneth Clark’s observation, stated at the beginning of his masterly study of Leonardo da Vinci, that “Great art needs to be reinterpreted for each generation”, may be a starting point, but “each generation” – especially in today’s society – cannot have a catch-all identity of its own, the more so as people are demonstrably living longer, resulting in inter-generational differences, that education appears to be in a constant state of flux (not just what is taught – or not taught – but how knowledge is conveyed), and communication in the modern world appears to be obsessed with what Marshall McLuhan (exactly 50 years ago) identified as the concept of “the medium is the message”. We can become so obsessed with the materials which constitute the ‘medium’ that any ‘message’ becomes very much a secondary matter: as Schoenberg (to slightly misquote him) said: “A Chinese philosopher speaks Chinese – the question is, ‘what is he saying?’.” Our subject of musical art, conveyed at it is today in terms and through media of which those of McLuhan’s generation could (and still can) only dream, may oblige us, whose task it is to sift through what we are offered, to follow blindly the developments of the media at the risk of losing the inherent message of what is intended to be conveyed. The instantaneous application of the conveying of knowledge may bring enormous benefits to mankind, but as Her Majesty the Queen said in her Christmas message, the additional benefits of “quiet reflection” should also form part of our lives – yet how rarely we get the opportunity of being able to practice such a state of mind. And even when we do – walking in the countryside or even when on a train journey – we are confronted by those to whom personal time has to be accompanied by a reassuring ripieno of music, or electronic or spoken communication via iPads or similar devices: our ‘personal time’, for ‘quiet reflection’, being impinged upon by the seemingly fashionable necessity of the latest piece of technology. The point is that we do not have to follow the crowd: ‘the medium’, no matter how pervasive it may be, cannot possibly be ‘the message’, and when one contemplates the up-coming programmes from orchestras, from recital rooms and concert halls, from opera houses and broadcasting organisations, the individuality that once was one of the inherent fascinations of concert-giving and concert-going of, say, McLuhan’s time (he died in 1980), appears to have become submerged in a kind of international sameness that is surely indicative of what Her Majesty enjoined us to do having largely disappeared from our lives. We may think that international artists’ agencies, representing musicians who have the good fortune to be associated with a major record company (the number of which shrinks annually, thanks to the rise of those who assume that financial considerations are the be-all and end-all of modern life: immensely important, of course, but not the end in itself – our Chinese philosopher, in a post-Schoenbergian frame of mind, might ask “what can you obtain with it?”) – such ‘world-famous’ musicians, whose very appearance is guaranteed to sell-out a concert, can fly to a dozen cities in a fortnight, performing the same repertoire, chosen, perhaps, with an eye to CD sales, rather than for the inherent ‘message’ a piece of music may possess in artistic terms. Our reviewers can only comment upon records that are issued; our concert reviewers can only remark on the music that is performed, and our broadcasting organisations, seemingly in competition with one another in terms of a catch-all situation of what constitutes ‘art’, can only broadcast the latest recordings that are released and the music that artists want to play. It would seem that, musically speaking, our ‘global village’ has shrunk, and the individuality that once made travel such an enlightening pursuit means that the high street of every town, every city, is the same: in the UK, it’s Marks & Spencer, TK Maxx, Wilkinson, Poundland, Sainsbury’s, MacDonalds, KFC and Lidl, cheek-by-jowl on pedestrianised shopping areas – in other words, every part of the country looks pretty much the same as we may see, without leaving our living-rooms, courtesy of Google Earth. But who makes those decisions as to what we may buy, or hear in concert-halls and the opera-house? Do not those people come from a certain generation, a generation that, educationally speaking, may have on the one hand ‘missed out on something’ or, on the other, were led to blindly assume that what they know is all that they need to know: driven by the fear of ‘financial considerations being the be-all and end-all’ of their daily work? Where is ‘art’ in all this? And more pertinently to our heading, where is the art of Paul Hindemith? Fifty years ago, one could readily and frequently read of four composers as being – I am not exaggerating – the most significant of the twentieth-century: Schoenberg, Stravinsky, Bartók and Hindemith. Other figures, little-appreciated, such as Messiaen and Elliott Carter, were not then considered in those terms: nor, perhaps, should they have been, given the circumstances of the day. Now, half-a-century later, times have changed to the point where symphonies by Mahler and Bruckner readily fill concert-halls that would have struggled to sell a ticket should those works have been programmed by exploratory concert societies with wealthy benefactors fifty and more years ago. The BBC is a different matter – or, rather, was – when the notion of ‘public service broadcasting’ was more readily appreciated than appears to be the case today, but now the BBC has changed beyond all recognition, so that even in radio terms – those exemplified by the spoken word – we may wait forever for complementary talks about music; nor, to judge by daily examples, may we rely on the BBC for accuracy in imparting information about the music the organisation continues to broadcast. Perhaps Hindemith’s death, at the age of 68, came at the wrong time, for luck – good as well as bad – certainly can play a part in people’s lives, but that surely is too simplistic an explanation, and in contemplating how it is that the music of a great musician (of that, we can certainly all agree on, and be sure), about which, 60 years ago, Andrew Porter could write in The Gramophone (as it was entitled then) that “Hindemith is having a spectacular innings at the moment” (with regard to the number of recordings of his music being issued), and yet which, in 2013, the year of the 50th-anniversary of his death, not one note of his music was to be heard during the BBC Proms Season. Odd, isn’t it? And yet the music itself has not changed: not one note is different from what it was at the time of the composer’s death on 28 December 1963. And for those who might query whether my assertion that he was a great musician (simply because one so rarely encounters his name these days, and certainly not at all if one’s guide to what is musically worthwhile is founded upon the 2013 BBC Proms Prospectus), one should point out that Hindemith could play every orchestral instrument, that he conducted Beethoven’s ‘Choral’ Symphony with the Philharmonia Orchestra at London’s Royal Festival Hall, that he played Beethoven’s Violin Concerto in Germany in 1915 before changing to the viola – on which instrument he became one of its very finest exponents, giving the world premieres of Walton’s Viola Concerto (with the composer conducting) and of Milhaud’s Viola Concerto No.1 (with Pierre Monteux conducting) in the same year, 1929; that he appeared on disc in five distinct capacities – as a conductor of his own and of other composers’ music, as a viola-player, as a pianist, and of course as a composer – capable, in the latter capacity – of enjoying “a spectacular innings”. A composer whose music was banned by the Nazis – though Hindemith, like Alban Berg, was not Jewish – and went on to become a profound musical educator in Europe (in Turkey and Switzerland) and in the United States, a man whose books, A Composer’s World and the four-volume Craft of Musical Composition, influenced a generation of composers, a teacher who made a powerful and lasting impact, Professor of Poetry at Harvard University, winner of the Sibelius Prize, who undertook a conducting tour of Japan with the Vienna Philharmonic Orchestra in 1956, and a composer whose finest works were taken up, performed and recorded by the best artists of the day – surely, such a musician deserves the epithet ‘great’ – for there is absolutely no-one alive on the planet today who can claim such a glittering, and – also, frankly – self-effacing career as Paul Hindemith had. With such an impressive list of achievements, is his music not worth investigating by our musical taste-makers? Is it now too difficult for them? If it is, then McLuhan was right – Hindemith is no longer part of the ‘medium’, and so his ‘message’ is reduced to that of one who is “crying in the wilderness”, but for those who remain unseduced by the glamour of technology and respond to the Queen’s plea for moments of “quiet contemplation”, might one direct the inquisitive individual (or the increasingly-frustrated concert-goer) to such demonstrable orchestral masterpieces as Hindemith’s great ‘Mathis der Maler’ Symphony (premiered, at significant personal risk to himself, by Wihelm Furtwängler, and which incurred the fearsome public wrath of Joseph Goebbels and other Nazi leaders), the noble Concert Music for Brass and Strings, his wonderful Symphonic Metamorphosis on Themes by Weber, and the ‘Pittsburgh’ Symphony (the second movement a delightful set of variations on a Dutch folksong), his profound ballet-score Nobilissima visione, the magnificent concertos for Cello (written for and premiered by Piatigorsky), Clarinet (Benny Goodman), Horn (Dennis Brain, who also recorded it) and especially for Violin (recorded twice by David Oistrakh) and those for Viola; the delightfully humorous Concerto for Woodwinds, Harp and Orchestra (the finale being a hilarious ‘take’ on Mendelssohn’s ‘Wedding March’), to say nothing of the operas – Mathis der Maler (written concurrently with the Symphony), Die Harmonie der Welt and The Long Christmas Dinner (the latter set to Thornton Wilder’s original English; Hindemith himself did the German translation) – nor are these this composer’s only worthwhile contributions to the operatic genre. 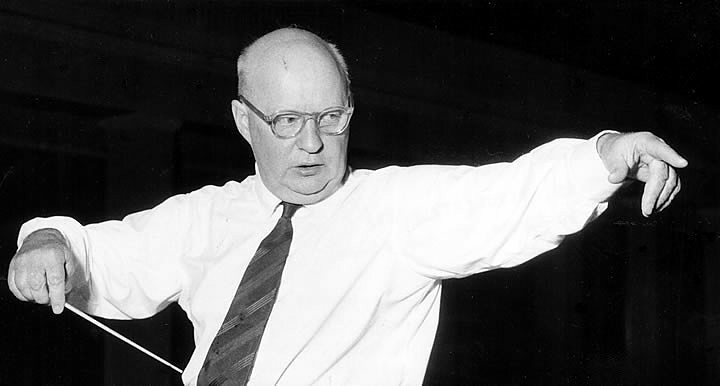 As a member of the Amar-Hindemith Quartet, Hindemith’s chamber music is headed by two masterpieces – the Third String Quartet and the Clarinet Quintet – and there is a long series of duo-sonatas for almost every known orchestral instrument with piano (the Alto Horn Sonata includes spoken dialogue – by the composer – between the musicians before the finale begins), and the solo Sonatas for Viola and for Violin (especially Opus 31/2, whose finale – ‘On a May morning’ – is a wondrous evocation of birdsong). Nor should one forget the whimsical Variations on ‘A Frog he went a-courting’ for cello and piano. In terms of neglected masterpieces, the song-cycle Das Marienleben for soprano and piano (to texts by Rilke) is one of the greatest such works of the last century (it exists in two versions) – fully worthy to be set alongside Schoenberg’s Das Buch der hängenden Gärten and Milhaud’s Alisse. His solo piano music is headed by the truly great Ludus Tonalis (an hour-long work, subtitled “studies in counterpoint, tonal organisation and piano playing”, not unworthy to be considered alongside the work of J. S. Bach – one must direct the reader’s attention to John McCabe’s magnificent Hyperion recording of this masterpiece, recently reissued). And Hyperion has recently released three stellar Hindemith discs, links to our reviews below, and to Das Marienleben. That may be enough to be going on with – but there is more, and one can only urge those who may be intrigued by the mere facts of Hindemith’s life to want to explore his by no means ‘difficult’ music for themselves, to investigate, through the medium of the gramophone, a legacy which – if left up to today’s musical tastemakers – is in serious danger of neglect. By the way, Hindemith also wrote the music for the 1927 cartoon Felix the Cat – so, he can’t be all bad.